Factory Pro designs and produces the best performing, highest power, easiest to tune carb kits around. Factory Pro, as USA's leaders in quality tuning products and manufacturer of the famous F-USA rated EC997 Eddy Current chassis dynamometer, has done carb and dynamometer work / development for just about every race team and manufacturer around over the years - including Honda, Kawasaki, Suzuki, Yamaha, Vesrah, Muzzys, Yoshimura, Attack, Kinko's, Arclight, Hooters on everything from 1.5 hp scooters to meg HP unlimited Formula Extreme bikes of years gone by. 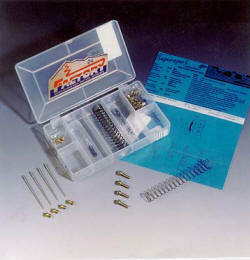 Additionally, Factory Pro designs and manufactures private labeled kits for aftermarket companies. Use stock airbox and stock / BMC / K&N or UNI stock replacement air filters. #1.7-RK RaceKit tm Maximum Full range Performance - AMA/WERA Winner - carb machining required! #3.0 Config 30 Kits Allow Airbox removal for the most power, runs individual filters. Kaw Vulcan Classic 1500 - AirBox Plus tm Add up to 5hp or almost 10% - Replaces the stock airbox with 9" heavy alloy black or satin capped airbox. Yamaha V Star 650 AirBox Plus tm Add 3-4hp or almost 10% with proper main jet - Removes the stock airbox - runs BMC Dual Style filter (included). POWER and DRIVEABILITY. Sustained full throttle power and perfectly linear throttle response are the goals of every tuner. Professional riders know that absolute throttle control will allow the quickest, most consistent lap times. Experienced mechanics know that proper design of carburetor needles and quality Keihin (say kay-heen), Mikuni or our new Factory Pro "K Series" Keihin main and pilot jets.